In a major story scheduled to be published on the front page of its Sunday (January 17, 2010) edition, the Chicago Tribune is reporting that Renaissance 2010, which has decimated more than 80 Chicago schools since it was first begun following an announcement by Mayor Richard M. Daley in June 2004, has failed. 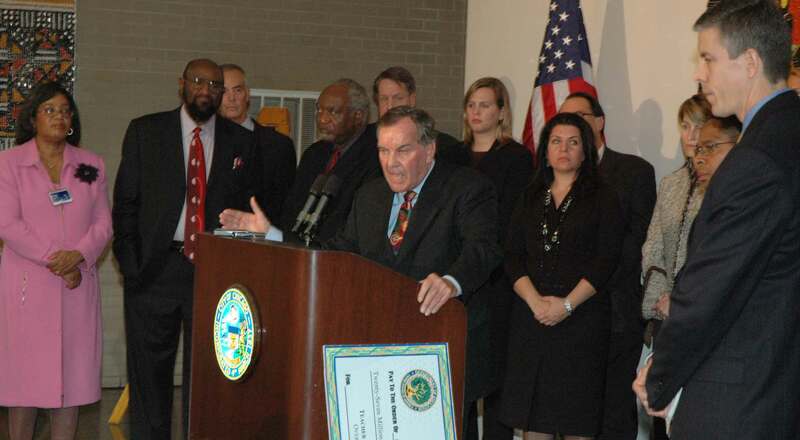 Chicago Mayor Richard M. Daley (above at podium) appeared at Chicago's Orr High School(s) on November 2, 2006, as "Principal for a Day." At the time (2006), Orr was supposedly following Daley's "Renaissance 2010" program by having divided itself into "small schools" (which was the flavor-of-the-day reform at the time). Two years later (see the following photo) Daley and Arne Duncan announced that the "Small Schools" at Orr had "failed" and Duncan ordered that Orr be one of the first so-called "turnaround" schools. By September 2008, the Academy for Urban School Leadership (which took over Orr and fired most of the teachers in the three small schools that remained) had gotten rid of more than half the veteran teachers at Orr and nearly 300 of the Orr students. Within a year, with no long-term data, AUSL was declaring that "turnaround" was a huge success at Orr, and Arne Duncan, by 2009 serving as U.S. Secretary of Education, was directing media to Orr to see how "turnaround" could work (leaving out the fact that roughly 25 percent of the Orr students had been purged in the opening month of the AUSL "turnaround." Some national media bought Duncan's version (including The New York Times, which featured Orr in a front page story about turnaround). In the ceremony above, Daley is receiving a check for $27 million from the U.S. Department of Education (then under President George W. Bush) for a merit pay plan. Among those in the photo above are Chicago's "Chief Education Officer" Barbara Eason Watkins (above left), Alderman Ed Smith (with glasses beside Watkins), Congressman Danny Davis (beside Smith), Chicago Board of Education President (at the time) Rufus Williams (second from right) and Chicago Schools "Chief Executive Office" Arne Duncan (left). Substance photo by George N. Schmidt.Without comment, what follows is the story as it appeared on line on the afternoon of January 16, 2010. The moribund test scores follow other less than enthusiastic findings about Renaissance 2010 -- that displaced students ended up mostly in other low performing schools and that mass closings led to youth violence as rival gang members ended up in the same classrooms. Together, they suggest the initiative hasn't lived up to its promise by this, its target year. On Saturday, Daley said schools that have been overhauled as part of the program are providing students better educations, even if test scores don't show it. "I've been in many Renaissance 2010 (schools), and that's doesn't mean you don't have to improve," Daley said after speaking at an anti-violence rally in the Roseland neighborhood. "But I've seen the different attitudes, by the parents, by the students, by the teachers. It's a whole different attitude at 2010 Renaissance schools. And that doesn't mean it's not a struggle, and everybody can evaluate the schools. But like anything else, they are getting better. I've been in these schools. I've seen the difference at a school that couldn't even control discipline that has discipline at the school. And that's the difference. And academically they are getting better." Most of the elementary schools overhauled by the Academy for Urban School Leadership, which changes the school staff but leaves the students in place, are outperforming their previous selves. The Noble Street charter schools, which operate in some of the toughest neighborhoods, have college-going rates that even suburban schools would envy. And innovation has flourished, as the city's first all-boys public high school, Urban Prep opened in Englewood, and the Chicago Virtual Charter School went online. Currently, 92 Renaissance 2010 schools enroll 34,000 children -- about 8 percent of the district total. Seven new schools will open in the fall, and the city plans to announce a new raft of school closings within the next few weeks. Some point to the 2005 closing of Carver High School as the flash point for the September death of Derrion Albert, the 16-year-old Fenger High School student who was beaten, kicked and smashed with large planks of wood about a half mile from school. District officials converted Carver into a military academy, sending teenagers to other schools, including Fenger. The two groups never got along and tempers flared inside and outside the school, culminating with the beating caught on videotape. At Harvard School for Excellence in Englewood, for example, pass rates increased from 32 percent to 56 percent since the private, nonprofit group took over two years ago. Principal Andre Cowling, a former Army captain who served in the first Gulf War, attributes the progress to a razor-sharp focus on data, parent outreach, teacher training and a culture of safety and learning. Cowling also opened single-gender classrooms and put overstuffed couches in hallways to encourage students to sit, relax and read. On Saturday, the mayor said the program will yield measurable results, but that it will take time. "It's a long struggle. You don't change something over night," Daley said. "So this is a long struggle in regards to quality education. I'll accept any criticism, and any adjustment of it, we'll look at it. But Renaissance 2010 is a good thing, because we have the business community put money in, everybody has made a commitment to provide a better quality of education. I believe in that. And that doesn't mean you don't have to tweak it or make a change. There's nothing wrong with that." Huberman cautions against tossing out the entire strategy, a reflex typical in education reform. Instead he plans to promote the components that work and get rid of the ones that don't -- even if that means closing down under-performing Renaissance 2010 charter schools, he said. Huberman has promised that students displaced by school closings will be guaranteed spots in higher performing schools and will be assigned staff members to help them adjust to their new schools. He told the Tribune on Friday that he will also set aside coveted spots in magnet schools to accommodate them. Huberman also promised to devise safe passage plans to make sure children can get to their new schools safely. "The first phase of Renaissance 2010 was the organic part of a brand new reform," he said. "In the second phase, we need to put our energy behind the proven factors that work and drive them hard. If we had not gone through stage one -- as painful as it might have been -- we could not get to stage two."